Cool Relief, a global provider of pain-relief services, has announced American beach volleyball players Casey Patterson and Jake Gibb as the brand’s newest global ambassadors for their long line of pain-relief products. Both Casey and Jake will be involved with upcoming ad campaigns for the brand as well as sport the brand’s logo when they compete. 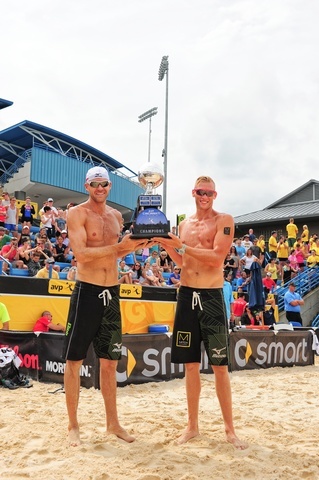 In recent months, Casey and Jake have emerged as the top ranked duo on the AVP Tour with impressive season numbers and a win at the AVP stop in Salt Lake City last week. Hot temperatures and shifty sand are a given in the world of beach volleyball, and these athletes know how essential rehabilitating injuries can be. “We’re entering into the prime of our career as playing partners and we can’t afford to let injuries slow us down. Cool Relief ice packs and wraps have been crucial to have on tour with us,” said Casey. Cool Relief currently offers a diverse line of ice packs, wraps, and injury recovery solutions in addition to a number of convenient household cooling items for the pool, car trips, backyard activities and more. Casey and Jake’s active lifestyle as professional athletes and adoring fathers back home make them the perfect ambassadors for Cool Relief’s line of products marketed towards professional athletes and the everyday consumer.